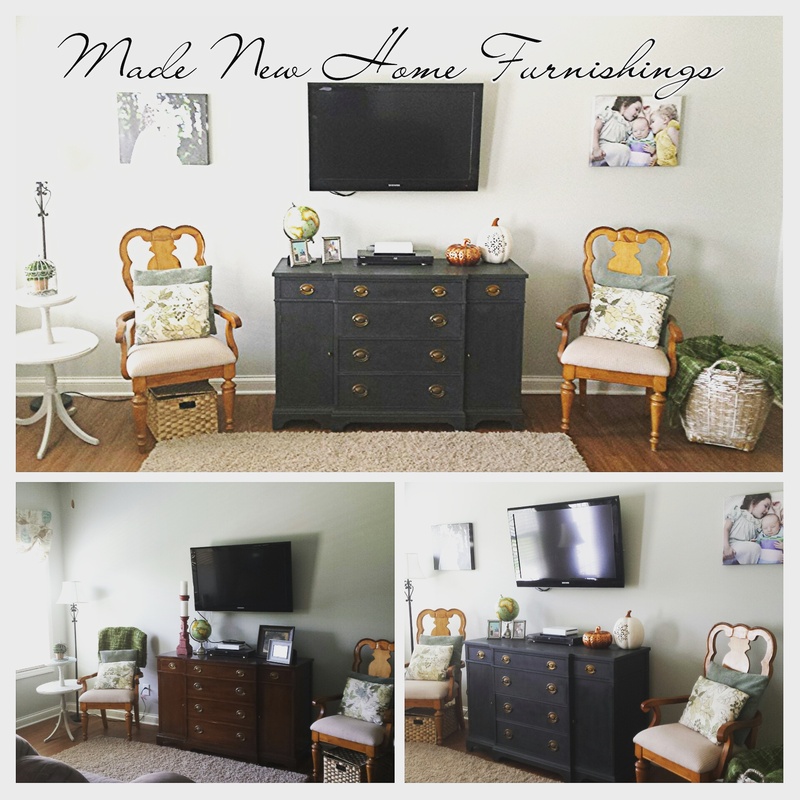 Made New Home Furnishings | A mom and wife who has been made new by Christ and finds joy in reviving and upcycling neglected, dated, & unloved items for the home. A mom and wife who has been made new by Christ and finds joy in reviving and upcycling neglected, dated, & unloved items for the home. Furniture and building projects have been put on hold as they usually are this time of year but I have had fun the last several weeks completing some small budget DIY projects. After taking down the Christmas decor I always have a moment of “ahhh, that’s better” that turns into, “now the house feels bare!”. I love the coziness and warm texture that winter decor brings but I also don’t love clutter or the look of over-decorating. However, once it is all put away I’m immediately ready for some new spring decor. I came across this cute little spring decoration at Target last week. I really love Forsythia. It is an early bloomer and anticipator of spring (like me!) and always, to me, the first sign that spring has arrived. I was ready to have some of that in my house! I wasn’t, however, ready to hand over $20 for a pretty item that I knew I could make at home for a few dollars. I picked up this smaller grapevine wreath and a forsythia stem at the Dollar Tree for $1 each. I already had a hurricane vase and a candle for the center. If you don’t, Dollar Tree has a few styles of vases and candles that would also work. Or you could pick up a hurricane vase at a number of different stores for $5=$10. Total you could make a nearly identical centerpiece for $4! I didn’t have to even get out my hot glue gun for this project because I was able to just weave the stems into the wreath and they are staying in place just fine! I was so happy to have a bit of new color in the house! This could be easily changed for the seasons, add in a cotton stem in the fall or winter. Or you could hang it when you get tired of it sitting on a surface. Hang on a door, over a mirror or in a hallway. It really doesn’t look like a cheap decoration (even though it was!). If you try either of these ideas, please share! Over the summer I was asked if I’d be interested in adding some content from a DIY blogger’s perspective in the form of a column to BG Home & Lifestyle magazine. It has been a fun little project and I was really happy to share some childhood memories in December’s issue. You can check that out here. When I started decorating the house for the holidays around Thanksgiving I realized we now live in a house with more space and I do not have many Christmas decorations! Of course we have a tree and a few things here and there but the visions in my head of it looking and feeling like Christmas in every nook and cranny of the house was not going to happen with what I had packed away in our Christmas tubs. Has anyone visited the white and sparkly Christmas decor aisle at Hobby Lobby?! It is wonderful. I stood there staring at the pretty weathered wood and glistening reindeer and and nativities and completely neglected tuned out my rowdy toddlers in the shopping cart. It was magnificent. Because I’m a stubburn DIY-er thoughtfully frugal person I went home totally inspired to actually make things out of the pallet collection in my garage and make said things wintery white and glistening with German glass glitter and twinkly lights. Nope…. didn’t happen. Who am I kidding? My Guy was away for a week on business two weeks ago and I am still recovering. I DID however come upon some live evergreen and become totally re-inspired to decorate but in the easiest and most natural way. I have a little bit of snipped and layered evergreen here and there and the house feels so warm and cozy. My Guy brought me home some more clippings from the Christmas tree farm we took the kids to this weekend and helped me make this pretty little centerpiece. I also filled an old whisky jug in the foyer with evergreen and fake berries and added some into my artificial garland. I hope you feel inspired to bring the outside in for your Christmas. Evergreen makes the prettiest tablescapes and brings amazing fragrance too. We brought home a pretty Christmas Hemlock to plant in our yard. It is supposed to be 70 degrees on Christmas! Who’d have thought we’d be planting this week? Especially because it was actually snowing on the day we went to the farm -crazy Kentucky weather! Little Guy did not appreciate the cold and cried about it-a lot. I feel ya kid. Every year I try to do at least a few homemade gifts. I think it is more meaningful and it typically helps our Christmas shopping budget. I was so excited with how this gift turned out that I had to share. It is a great gift for that person who doesn’t really need anything yet you want to give them something meaningful. It works for any holiday or occasion and it is inexpensive to boot! I was at Hobby Lobby and came across some wood trays with handles. The trays in the link are part of a set. They do sell them individually in the store. I picked one up for $5.99 less 40% from my coupon (so only $3.60!). I had the idea that I may paint it (of course, right?!). When I got home a great gift idea hit me though for the grandparents in our family who can never seem to get enough pictures of their grandbabies! I decided to decoupage a collage of pictures to the inside of the tray. of course your wood tray either stained or painted, or both! First I stained the tray in dark walnut. My idea was that I would stain it and then paint it so that when I distressed the edges the dark wood would show through instead of the unfinished pine. Once I stained it though I really loved the wood grain and decided to leave it as is. I selected some photos, both old and new, and had the ones I didn’t have on hand printed. I picked a few wallets just to add variety of size for visual interest. Next, I arranged my photos. I had to trim a few edges and rearrange a few times. Once I had them how I wanted them I took a picture so that I’d remember the layout after I took them off again. To adhere the pictures to the tray cover the bottom in a thin coat of Mod Podge (MP). You can see I did this really carefully (not!). I’m a pour and spread kind of gal. If you want to be neat and more careful about not glopping in the corners then you may want to pour some in a paper bowl or plate for easy dipping of your brush. Lay out the pictures and MP in between any places that overlap. Don’t underestimate how fast the MP can dry. You can see I had some unwanted gaps because I waited too long to scoot them into perfect position. Oops! While I let this dry I used my Silhouette Cameo to cut out some text to add to the collage. I simply did the kids names and “Great Grandchildren”. You don’t have to add text at all or you could do other scrapbook embellishments or text from a magazine -whatever you want! I decoupaged the text on next by adding a thin coat underneath, arranging the text and then I went over the entire collage with my first thin top coat. I like to get my strokes in the same direction and watch for any bubbles. I let it dry 15-20 minutes and did 2 more thin coats to really make sure the pictures weren’t going anywhere and to ensure the tray would actually be usable. Don’t freak out. It dries clear! That’s it! I took about half of a day to complete which included time in between taking care of my kids. I plan to do a few more for other family members and maybe another for a wedding. A few other ideas using this tray could be to decoupage scrapbook paper to the tray and do a monogram or do a monogram all by itself. The possibilities are endless. If you try this project please share pictures with me on Facebook or via email! taking pictures, and transporting my gift across the country to its recipient. Love you! It is Fall! Pumpkin Spice and Apple Pie lovers unite! I realize I am late to this party but I am just now getting to share my enthusiasm because we also FINALLY have internet. One complication I was not anticipating with a new construction was that there was no internet available yet! But now I am ready to roll and share some more pictures of our new place and latest budget projects! I finally came to a decision that I have been putting off -to paint our buffet. It is now serving as a media console in our living room. 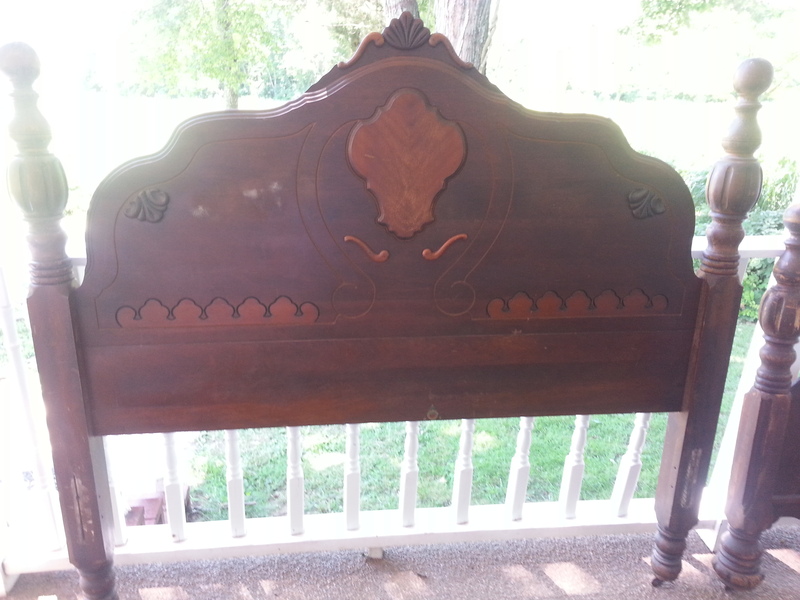 I have gone back and forth for a year now about whether to re-stain it, paint it, or just clean it up with Restor-a-finish. We bought it from sweet friends before they went to the Philippines on mission as The Isaiah Project to provide clean water to those without. You can follow them on Facebook here. After much toiling about whether going light or dark, I chose Annie Sloan’s graphite and finished it with a dark glaze. I love the blue undertone in the room and I that it gives it a stately feel. I feel like I have a new piece of furniture for the cost of paint and a few hours work! Now time to update those chairs! 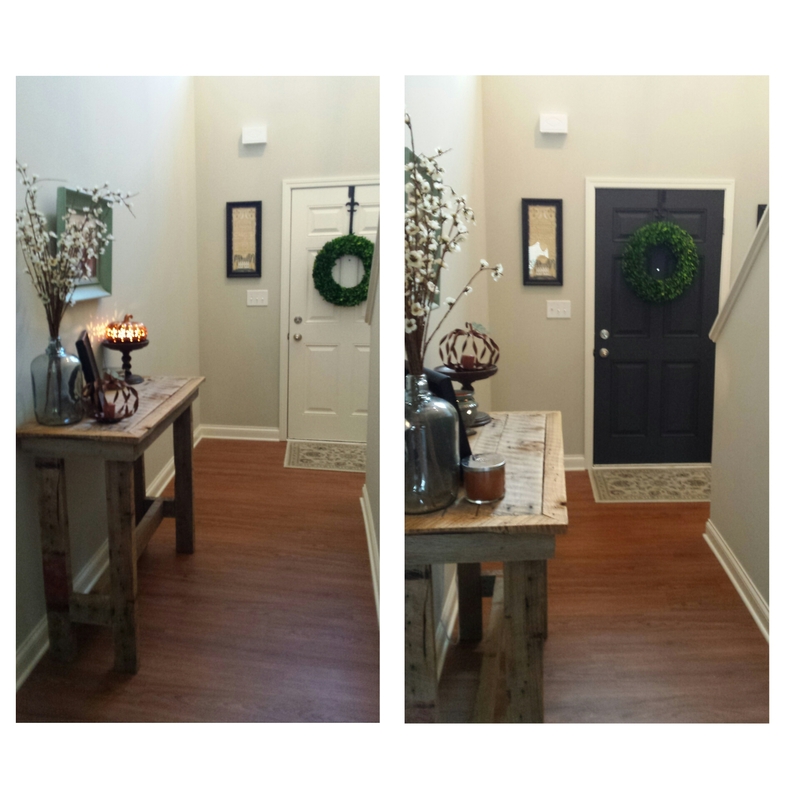 Another one of the things I was happy to finish last week was Project: Welcoming Foyer. Our walls are all a neutral gray and we have a two story entry with oak stairs. 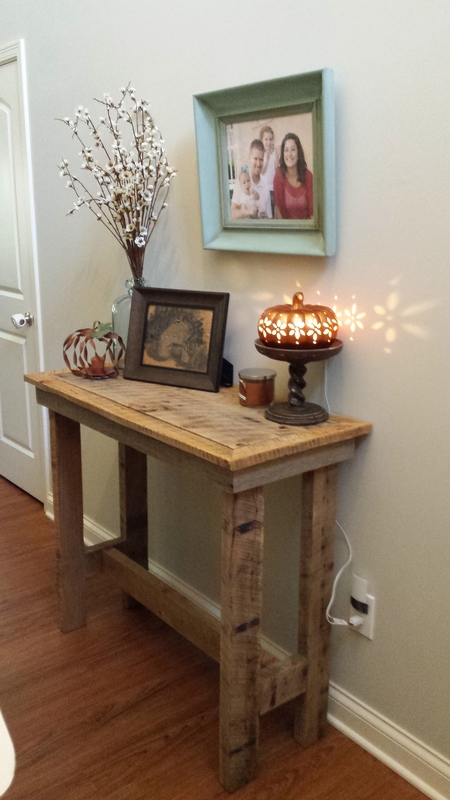 Our foyer was just screaming for a table. It is narrow though so my normal Craigslist perusing wasn’t fitting the bill because the console tables I was finding were too deep and would block the walkway- which is kind of important! I had rustic style in mind and I had the fantastic idea to reach out to a talented friend of ours who happens to be a builder of all things barnwood and a handy man of all sorts. I was so thankful he was up to the task and he really caught my vision. If you are in Kentucky and are interested in utilizing his talents you can contact him on Facebook here! I have rearranged and changed the decor on top 100 times already and should have hid that plug better for the pic but I love how it turned out! I chose to leave the wood unfinished because there are some fun paint remnants and markings that add the character I was hoping for so I just sanded the rough spots and left it as is. The picture frame was a $.50 yard sale find! It was bright gold. I painted it ASCP Duck Egg Blue and finished with clear and dark wax. The table definitely added a warm welcoming touch to the entry but I really wanted to add a punch of something different to the door. So I used the same graphite I used on the buffet to paint the door and left it a matte finish. We moved in a month ago and every room still feels like a work in progress but I am really happy how things are coming together. Especially in the girls room which may be my favorite! 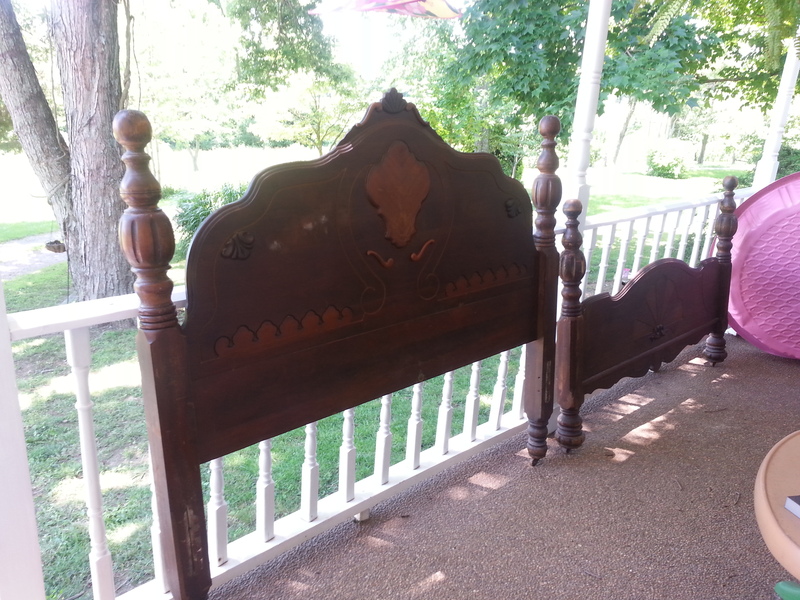 My mother in law was offered an antique bedroom set at a deeply discounted price because it belonged to a friend and needed a lot of TLC. 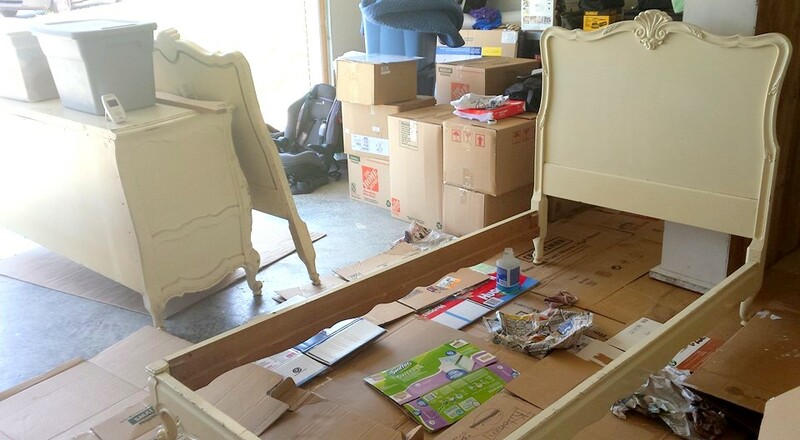 Here is a before of the beds in a garage full of boxes during move-in week. It turned out stunning! 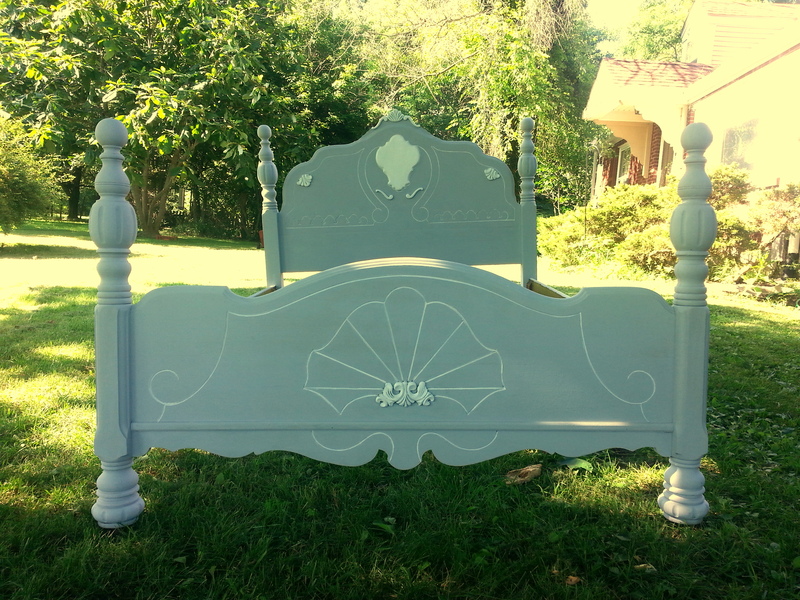 I will share the other pieces in another post because the dresser ended up in our bedroom but the twin beds were cleaned up and painted for the girls room and they are perfect. 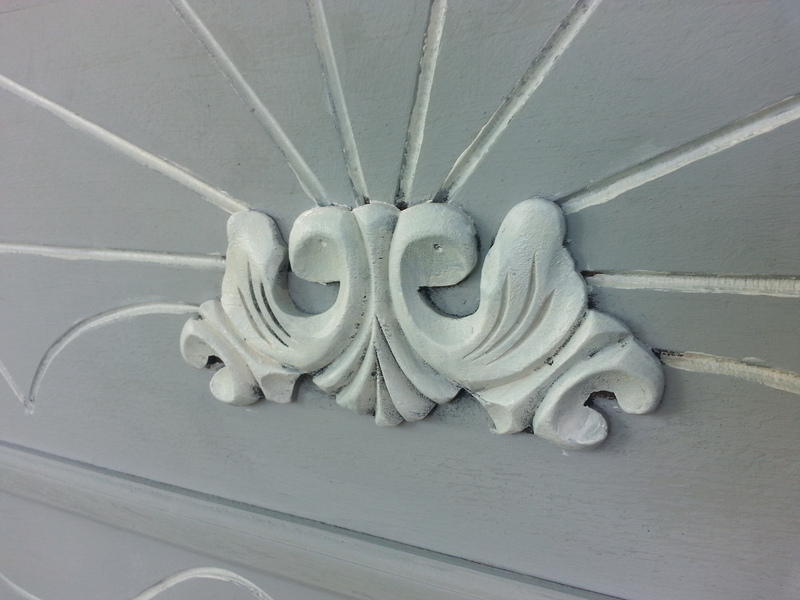 They are painted in Valspar Painter’s White and Filtered Shade. The room is painted Sherwin Williams Silver Strand. I love this subtle blue gray and how the other colors in the room really are complemented by it. I could have used this color all over the house and been happy with it. The tee-pee is from Hobby Lobby. 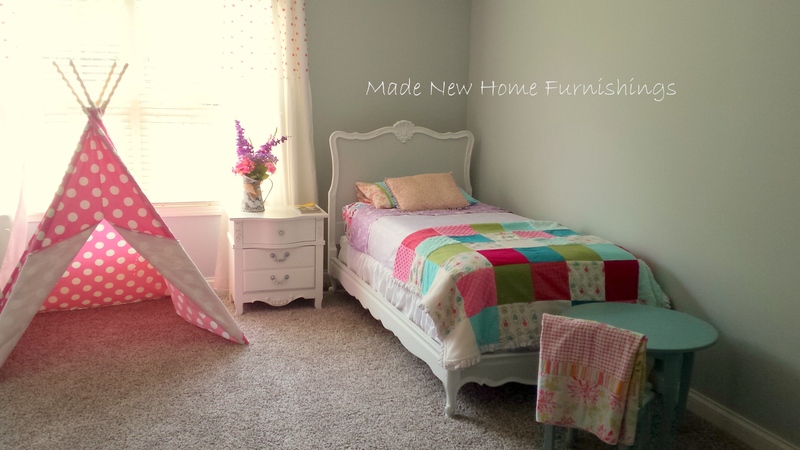 My mom and I loved surprising the girls with this when they saw their new room for the first time. 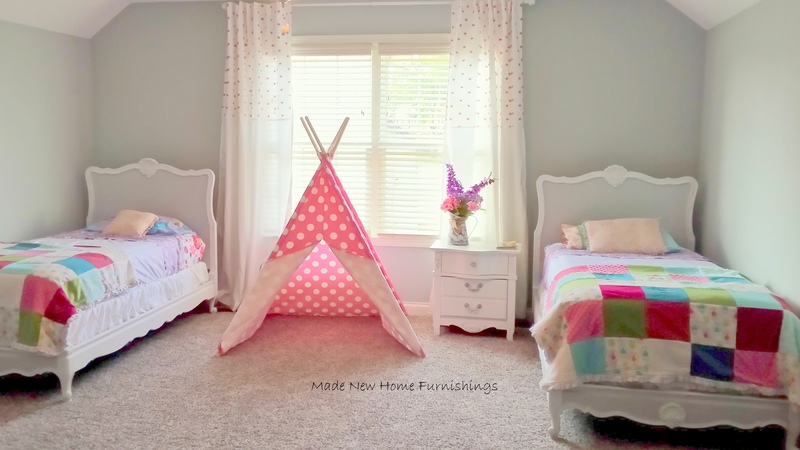 The polka dots are so cute paired with the pom poms on the curtains and minky on their quilts. I love spending time in here with them. I am thankful for the walk in closet with cubbies and bins that make it easier to put toys away. They love to play house or super spies in the tee-pee or restaurant at the table that I found at a consignment store and painted Provence Blue. 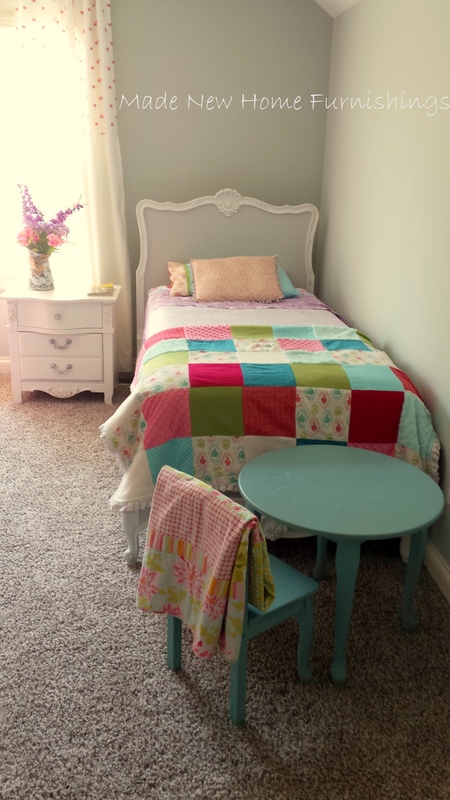 My goal was a fun room that feels like their special place filled with colors they love. It isn’t too overdone so it can easily grow with them. I look forward to adding art and pictures and there has been discussion of a willow tree painted in the opposite corner to shade the tee-pee. That would be a fun one for a future tutorial! You may have seen this unassuming can on the shelves of you local hardware store. I’ve even seen it randomly on the shelves of our TJ Maxx at a great price. I found it for the first time years ago in a booth at a furniture consignment store. I scooped it up to keep on hand. It does just what it says! 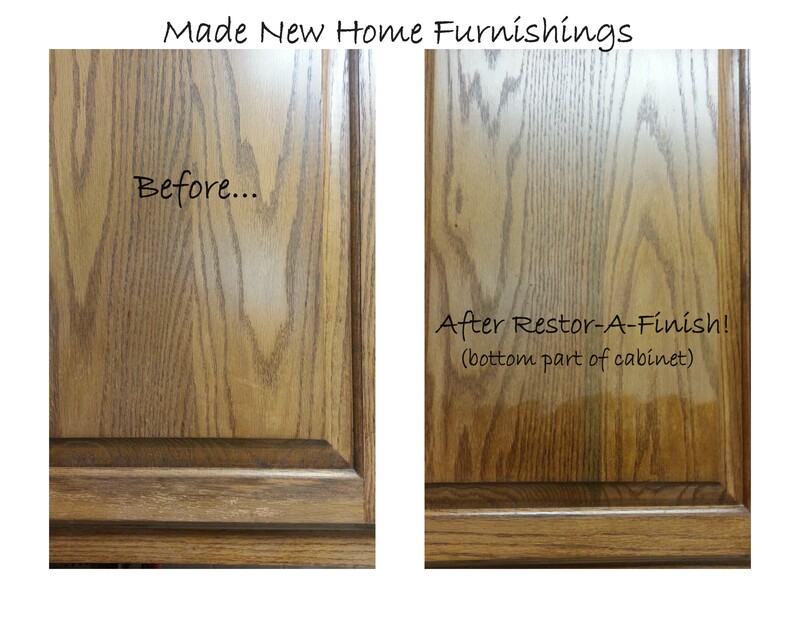 Introducing… Restor-A-Finish. I am not even getting paid to share with you how awesome this product is! I’ve used it on a number of pieces in our home. Click the picture to visit my Amazon shop to see the different finishes. It came to mind to share this product with you this week because it came in handy once again. We are staying with family briefly while waiting for our home to be built. My mother in law and I have fun talking about redesigning her kitchen. They live in a home that was build in 1910 and while the home has been updated, no updates come without very careful consideration. One of the more recent discussions have been about cabinets. They are not quite ready to replace them or paint them but they did need some TLC. The finish was quite worn in areas. You can see the difference Restor-A-Finish made immediately. I snapped this picture right when I started to add the product. I knew it would look better but I was shocked at the difference. 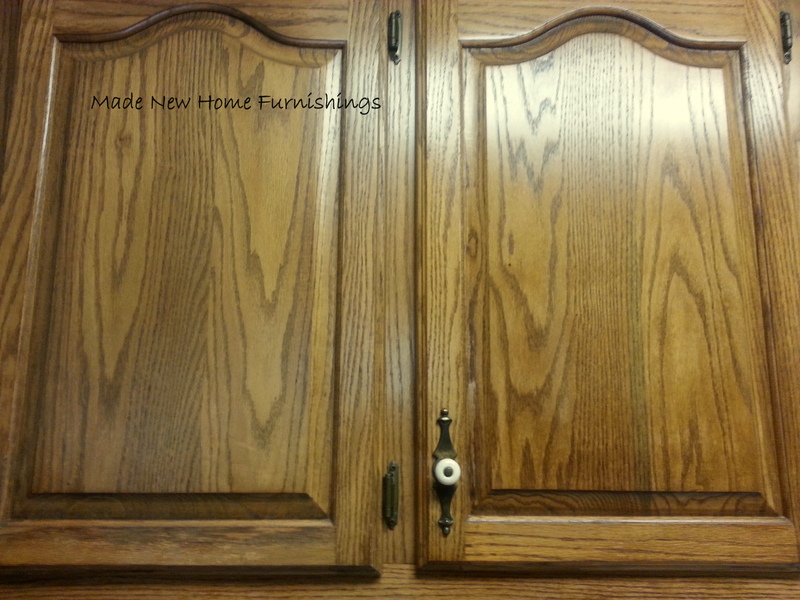 When I took this picture it was only applied in the bottom right hand part of the cabinet to show the difference. Much better! Left side is finished, right side is Restor-A-Finished. We added the product to the entire kitchen. Application for this job was easy, with a rag. I do recommend wearing a latex glove, like you would with stain. For deeper gouges you can apply carefully with a super fine steel wool pad. Wipe it on with the wood grain then wipe off excess and let it dry. Once you start, it is hard to stop! After this I took it to her oak table and server to disguise some nicks and water rings. Works beautifully! Hope this suggestion helps add new life to some piece in your home! This weekend we had beautiful weather. A bit less warm than a typical Kentucky summer day in June. I was thankful to have a couple of jobs lined up. 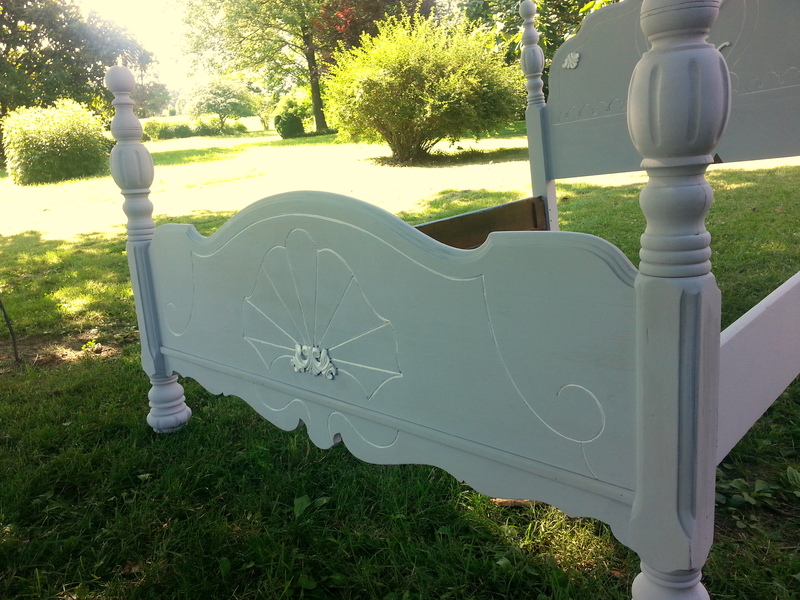 One was a painted and glazed bathroom vanity that I will share in a future post and the second was this beautiful antique bed. The breeze was so nice on the front porch! I was so thankful that the kids took a great nap too. 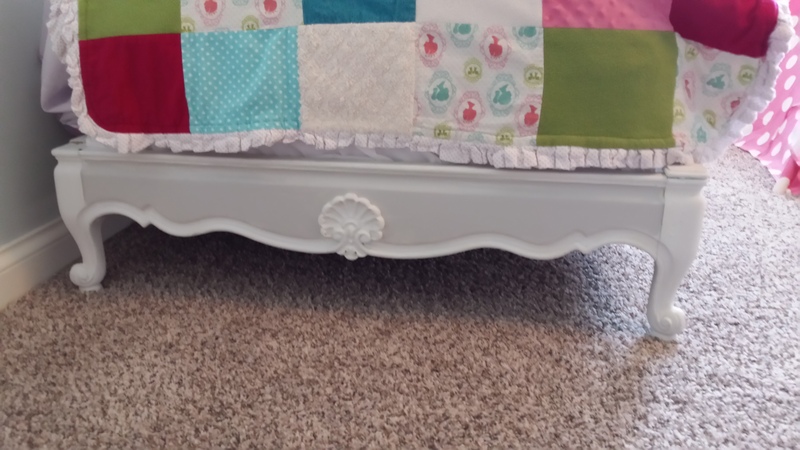 I was able to get the bed finished within a day. 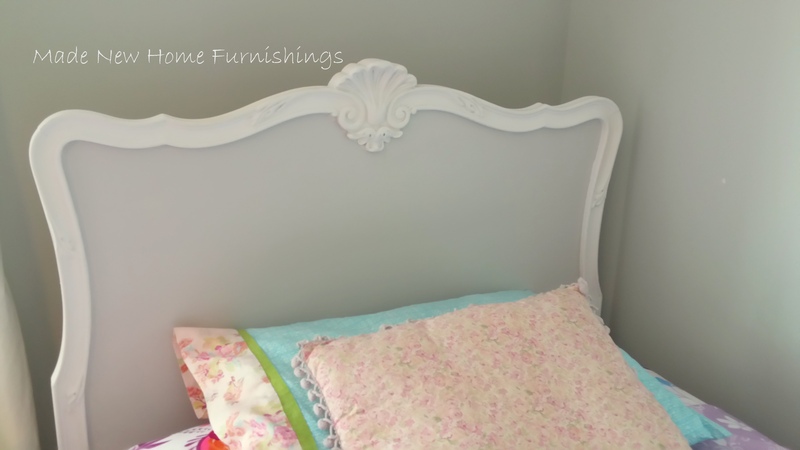 I strayed from my favorite Annie Sloan Chalk Paint for this project and used Americana Decor’s Chalky Finish paint in Yesteryear which is a gray with a bit of blue and beige undertone. I painted the accents and inlays white. 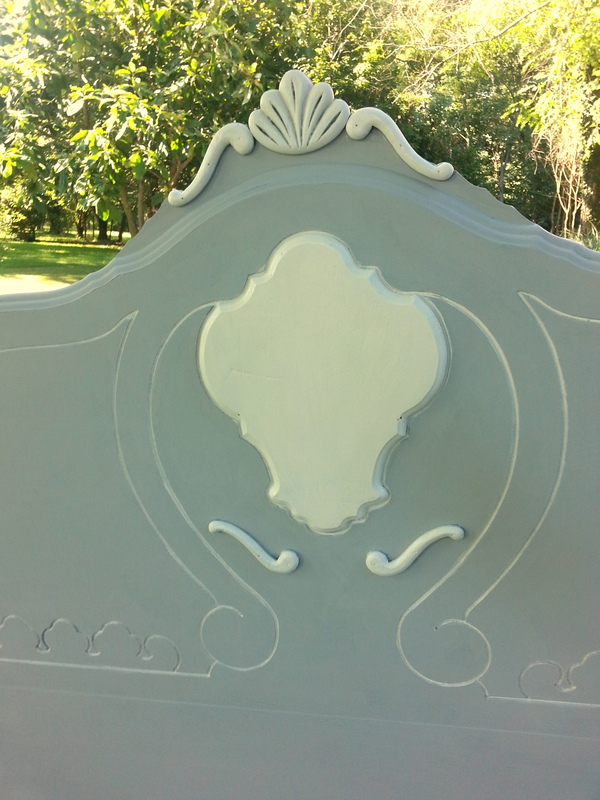 I had a quart of Silver Feather by Valspar on hand so that is what used. The detail in the wood went a bit unnoticed with the dark stain finish. The wood work is quite stunning. I painted around the manufacturer’s mark. 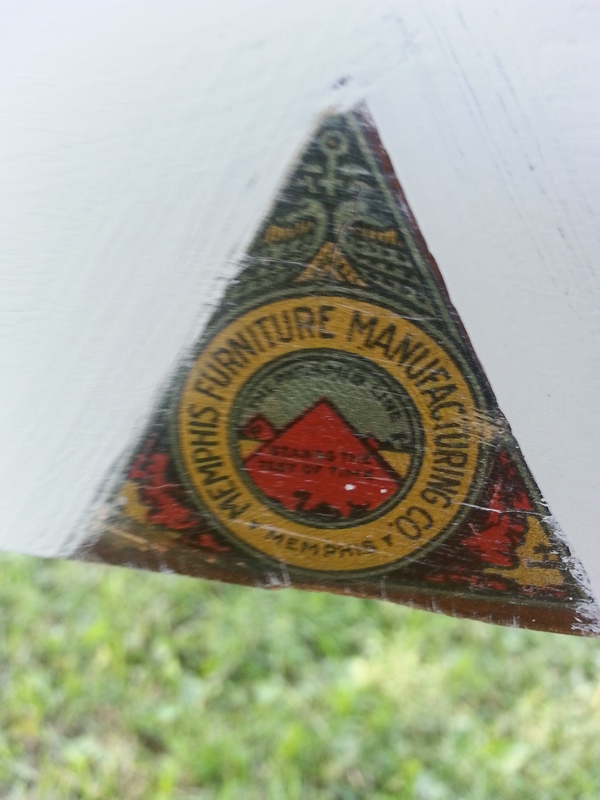 It says Memphis Furniture Manufacturing Co. and “The pyramid line stands the test of time”. There wasn’t any other marking on the bed. I’m thinking it may have been built in the 1920’s or 30’s? If anyone has an idea, let me know! 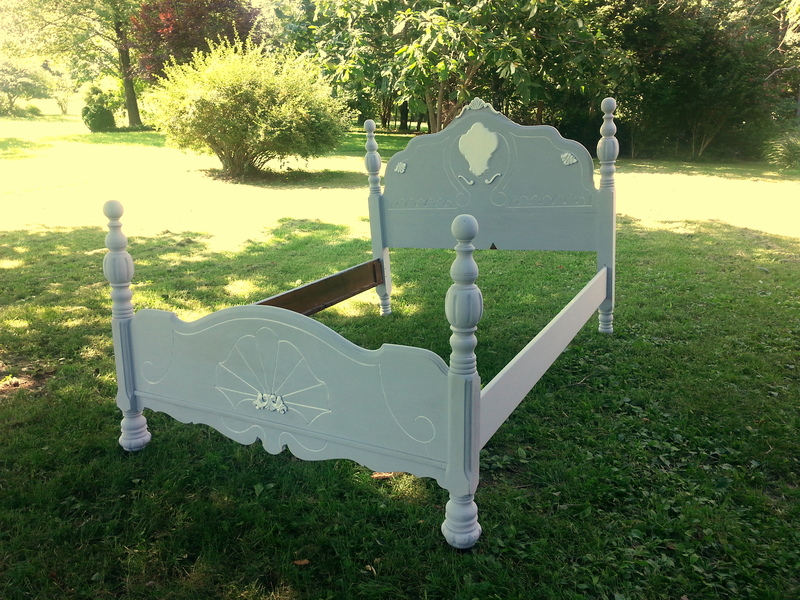 This bed is truly a beautiful piece of craftsmanship. It is hard to come by these today. I felt to honored to be able to give it new life. The room it belongs in is pale yellow. The bedding is white, pale blue and yellow. I think it turned out beautifully. I hope its owner does too! I am a mom and wife who has been made new by Christ. 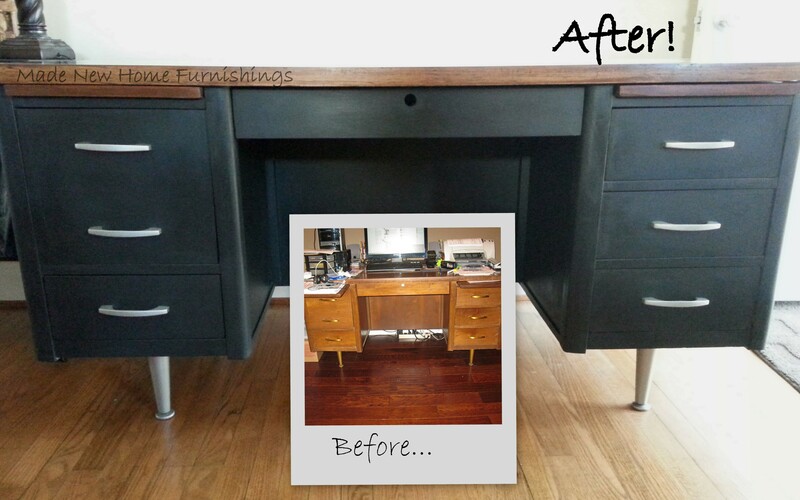 I find joy in reviving and upcycling neglected, dated, & unloved items for the home. Join me in my painting, crafting, sewing, and life adventures! Tara on Welcome to my new space! Karen on Welcome to my new space!